While much national attention was focused on efforts to restrict abortion in Texas, a new study from the Guttmacher Institute reports that as many as 22 states enacted 70 provisions aimed at curbing access to abortion. That makes 2013 second only to 2011 in the number of abortion restrictions enacted in a single year, according to the think tank for reproductive rights. 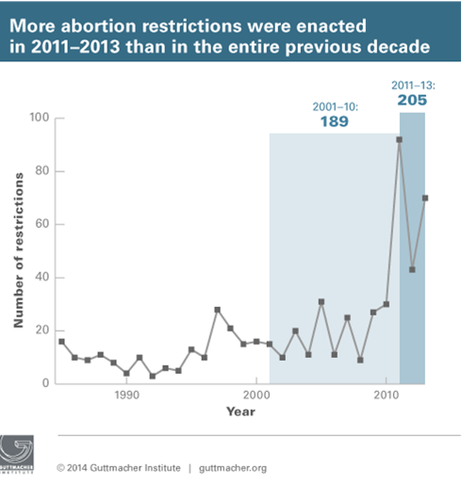 To put the recent trend in some perspective: The 205 abortion restrictions enacted between 2011 and 2013 were more than the 189 enacted during the entire previous decade (2001 to 2010). Regulations aimed at closing down abortion clinics by imposing restrictions that go beyond those required to protect patient safety. One such rule forces clinics to meet standards that were designed for hospitals or outpatient surgery centers that do more advanced techniques; another requires doctors who perform abortions to have hospital admitting privileges. Limits on insurance coverage of abortion, particularly within the new health exchanges that have been set up to sell coverage under the Affordable Care Act. Bans on abortion after 20 weeks of pregnancy. Limits on abortions that rely on pills rather than surgery. Advocates for abortion rights, taking heart from recent signs in Virginia and New Mexico that proposals for strong or intrusive controls may alienate voters, hope to help unseat some Republican governors this year as well as shore up the Democratic majority in the United States Senate. Anti-abortion groups aim to consolidate their position in dozens of states and to push the Senate to support a proposal adopted by the Republican-controlled House for a nationwide ban on most abortions at 20 weeks after conception. “I think we are at a potential turning point: Either access to abortion will be dramatically restricted in the coming year or perhaps the pushback will begin,” said Suzanne Goldberg, director of the Center for Gender and Sexuality Law at Columbia University. The anti-abortion groups, for their part, feel emboldened by new tactics that they say have wide public appeal even as they push the edges of Supreme Court guidelines, including costly clinic regulations and bans on late abortions. “I think it is more difficult to get an abortion in the country today,” she said. It is encouraging that there is more attention being paid to this trend and hopefully we will really see a pushback to defend reproductive rights. Over the last few years we have seen dramatic increases in support for liberal positions on social issues ranging from marriage equality to ending prohibition of marijuana. Hopefully we will see the same with reproductive rights.